In case you don’t know, this is a tomato plant — specifically, a Roma Tomato. See the babies hanging all over it?? I remember when Mama brought this thing home. It was a skinny stick about six inches tall with a few bedraggled leaves. I didn’t think it would hang around long. I figured it would die, and Mama would turn her attention to something more important. Or that novel she’s supposed to be marketing. Mama cleaned a huge pot and filled it with something called Miracle Grow, placing the tiny stick in the middle. Optimistic, I thought, as I watched the proceedings. Then she fertilized it with Epsom salt (her aunt swears by it) and water. Every day she goes outside to take a look at it, pick off “suckers,” check the stakes, and talk nice to it. Like that’s going to help. But it must have because here we are several weeks later, and this monster is sharing my patio. Now Mama does just fine with flowers and such, but this is the first tomato she’s attempted. She’s hopeful the babies will ripen and who knows? They probably will. 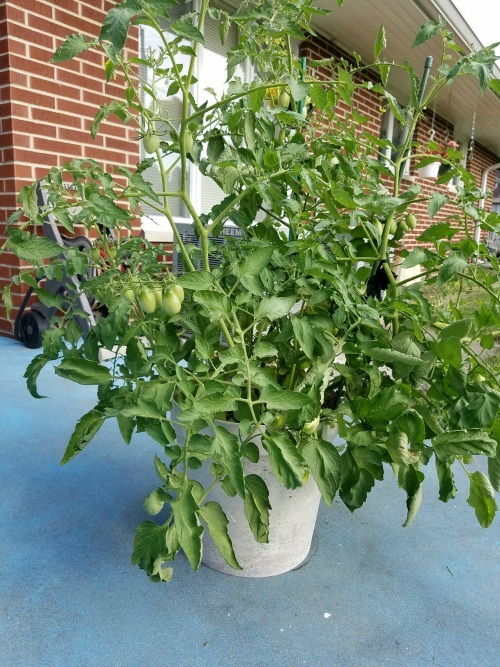 This entry was posted in Seasonal and tagged gardening, green thumb, roma tomatoes, tomato plant. Bookmark the permalink. How exciting! I don’t have enough sunshine to try tomatoes, but I think it would be wonderfully fun. Congrats on your first crop! I know that chickens and ducks like to eat tomatoes — do dogs? Thanks, Miss Linda. I Dallas don’t think I’ve ever had a tomato. There’s a substance in green tomatoes that’s not good for doggies, but ripened ones are okay in small doses. I never bother looking at the plant actually, so Mama doesn’t have to worry about me tasting it. Hey, Dallas! I hope you are well. Those baby tomatoes are delightful! You probably shouldn’t eat them, though, in case your mamma gets cross with you. I don’t know if they are good for doggy tummies. Miss Lucy, the American Kennel Club advises against feeding dogs tomatoes because they’re members of the nightshade family and contain solanine (which can be harmful). I’m not particularly interested in this whole experiment of Mama’s. I merely wish this plant had not grow so immense that it hogs my patio. And I’d rather not have to listen while Mama talks to it, either! Mama might not forgive me if I’m stern with this thing and it shrivels up and dies! She says you have to talk sweetly to plants to encourage them to grow. Huh, what a bunch of nonsense!! Please tell Mama I said, BRAVA on bringing that tomato plant back to life. I can hardly believe the before and after photographs, it looks like a completely different plant! And thanks for the tip about the Epsom salt, who knew? Unlike Mama, I have a black thumb when it comes to growing plants, flowers, etc. I kill everything. I’ve even killed a silk plant – HA! Have a great week, Dallas! And tell Mama I said, Hello! Mr. Ron, seriously? You’ve killed a silk plant? That’s too funny! Maybe I Dallas need to come live with you while Mama is babysitting this ridiculous tomato plant. I can’t imagine why she wanted to grow the thing in the first place and to have it get so big with so many babies on it is just irksome. I can only hope Fall will arrive soon so the thing really will die off, and Mama can get back to paying proper attention to ME! Happy week to you — woof!! Ah, there’s nothing much in this world as sweet as a vine ripened tomato – quintessential summer goodness. These are beautiful. Enjoy! Thanks, Miss Barb. I’ll pass your compliments on to Mama … maybe. I don’t want her head to swell, thinking she’s a real gardener and all! I love Roma’s. I wish we could grow them here. Sadly no. Tell mama to enjoy them. Thanks, Mr. John. Tell me, would Bailey and Stella permit you to grow such a beast on your patio? I think not. You are so right, Dallas They would not. I Dallas knew you two would understand! A dog biscuit tree would be perfect, and now that Mama thinks she’s got a green thumb, why, she needs to give one a try. Two benefits I can see: treats for me and a nice boost to her self-confidence. Thanks for the suggestion, Tommy and Tuppence!! Isn’t every Irish woman a lover of the land, Audrey?! Thanks for the encouragement. 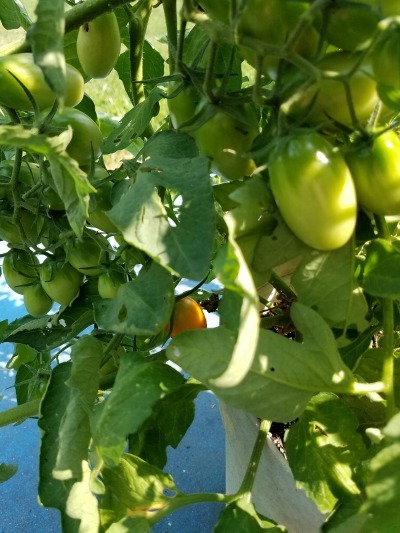 I’m already looking forward to picking the first ripened tomato! Very cool, Debbie. I will check it out, thanks! Now Dallas, you need to be more supportive of your mom’s efforts! Katie LOVES tomatoes and you might too, if you try a little piece of one Is she going to make tomato sauce with those Romas? They should be getting red any time now. Your job might be to make sure no marauding squirrels steal the fruit! So Dallas do you like tomatoes? Bet mama can’t wait to enjoy the fruits of her efforts. Never heard of epsom salt fertilizer. That is a new one.